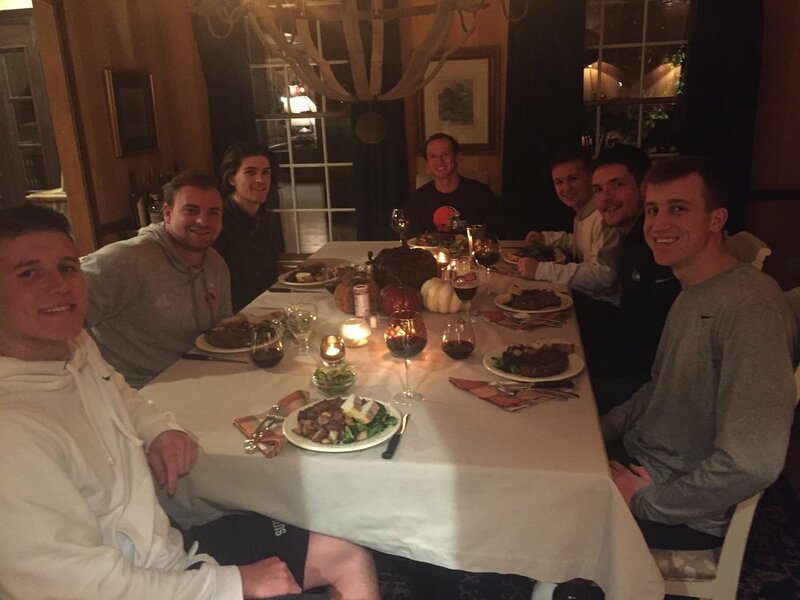 It was a great November weekend for eight Theta Deuteron brothers to road trip to Cleveland and attend their newly-found favorite sports team: the Cleveland Browns! Brother Matt “go-getter” Brault, AJ “Uhh…uhhhyyuuupp” Outcalt, Jordan “Good Vibes Only” Auriemma, Ben “I am truly a Browns fan now” Whitbourn, Jack “the pros stop there” Dugan, Aunders “Slow Rising” Erickson, Nick “I lost my phone” Braydich and Mike “Joe Thomas” Heeshan all caravanned up to brother Outcalt’s house in Avon Lake. On the way up, the boys updated followers on their Instagram account with video, pictures, and a questionnaire for followers to ask the brothers questions. Some of the questions the boys were asked were: birthday next week who’s coming to celebrate, is AJ single? He’s cute <3, what is Ben’s favorite American football team, what’s the swimmers diet, are the Browns going to win or lose, is Ben stressed out and whose playlist are you coasting to. In the morning, Nancy and Andy prepared a 4.5-star breakfast including sandwiches (bacon and/or sausage, egg, cheese, english muffin) for the boys, along with coffee, Dunkin’s donuts and HUGE bowl of fruit (apples, strawberries, blueberries and more). As the boys took the scenic route down Ohio’s Route 6 (Lake rd.) they enjoyed smooth tunes from Brother Outcalt’s famous Spotify playlist, “Shreddar of the Gnar.” Upon parking at their tailgate spot on W 6th street, Nick “I think I lost my wallet” Braydich miraculously and immediately found his wallet in the trunk of the car… what a relief!! The bros then hung out with Browns fans, tossed the football around and walked First Energy Stadium. 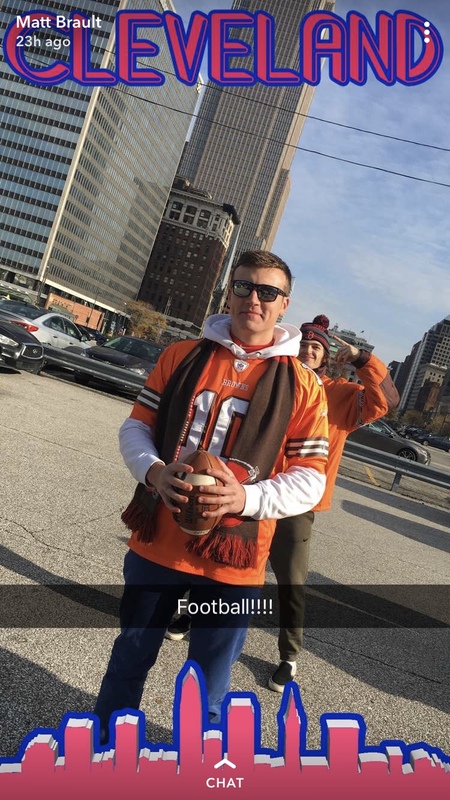 En route, brothers Jack “the pros stop there” Dugan, and Mike “Joe Thomas” Heeshan sniped a fresh Browns beanie from a side-street vendor. Like any other day, Baker Mayfield woke up feeling DANGEROUS and boy was this a good thing for the Fiji boys, and Cleveland… Baker led the win deprived Browns to their first win in November since 2014 (28-16)! Highlights include a step-back (Kobe) deep ball to Reshawd Higgins in the 1st Quarter, a franchise record 92-yard rushing touchdown from Nick Chubb and a stellar goal-line stand led by Myles Garret & Co. Overall, it’s safe to say this weekend was one for the books, and will serve as a very memorable weekend for many years to come!! Not for college days alone! - P!